I love pastrami and Montreal smoked meat: tender, very tasty beef brisket cured, smoked and steamed to an umptuous pile of goodness. Unfortunately beef brisket is expensive, relatively speaking: the cheapest I could find was $5 a pound. My go-to meat for all things charcuterie is pork, and right now whole pork legs are going for $1 a pound in my neck of the woods. Yes I’m paying for the skin and bone along with the leg meat, but I render the skin for pork fat and the bone is used for stock so nothing is going to waste. 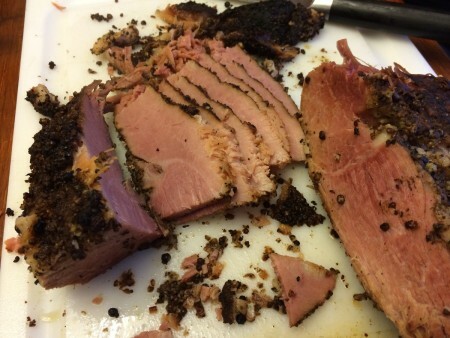 I have made pastrami before with eye of round but it was too lean and only worked sliced thinly for sandwiches. I wanted to recreate the experience of hand carving warm pastrami for a true Schwartz style sandwich. After carving up a few pork legs I ended up with one or two round ham shaped pieces and one or two even rectangular pieces: these would work perfectly to simulate the shape of beef brisket. 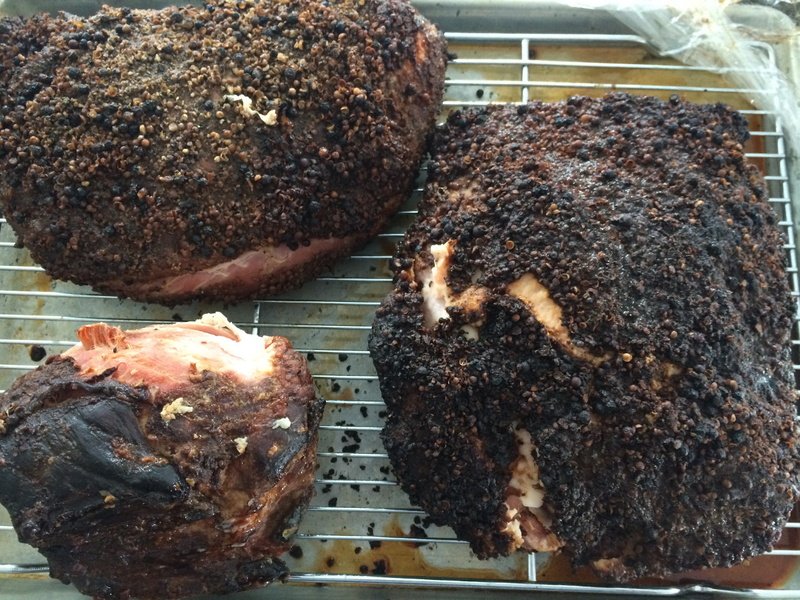 The round pieces ended up as hams, except for one that was left behind and ended up with in the pastrami batch. Any size piece will work, but an even size allows for uniform bringing and smoking. Pork shoulder would also work here, especially if you like your pastrami on the fatty side. When cutting and trimming the meat only leave a thin layer of fat on the exterior: if the fat cap is too thick it will inhibit the brine from fully penetrating the meat. I was pretty footloose on this process. Normally I’d leave the meat in the brine for a week but things were busy so I left it two weeks and it worked great so I’m recommending that here. Traditionally pastrami is hot smoked and then steamed for several hours to attain a soft texture. Since I was smoking the meat in a moist environment I let it continue to cook on the smoker until it was fork tender, much like pulled pork. This saved me the awkward step of trying to steam large pieces of meat in the house. To serve I did steam smaller pieces until warm, as shown above. The meat achieved a reddish hue and the pickling spices and spice coating attained the pastrami taste I was looking for, while the low and slow smoking gave the desired texture. This was a solid win: everyone in the house was going crazy whenever I lifted the lid on the pot while it was warming up: the smell was pure pastrami. This recipe is adapted from Brian Polcyn and Michael Ruhlman’s Charcuterie. 1 five pound piece of pork leg or shoulder, uniform thickness with a thin layer of fat. Combine brine ingredients in a large stockpot and bring to a simmer, until the salt and sugar have dissolved. Let cool completely and then put the meat in a container and completely cover it with the brine. Weigh the meat down with a plate to keep it completely submerged. Refrigerate for approximately two weeks. Remove the meat from the brine and rinse thoroughly, then place on a wire rack in a baking sheet uncovered in the refrigerator for at least 24 hours. Get your wood chips soaking. Start your Big Green Egg/smoker/barbeque and get it to 200 degrees. Apply the rub to the meat evenly in a thick coating. Add the wood chips and the meat to the smoker and leave until fork tender, about four hours depending on external temperature, device used and thickness of meat. Give the wire rack and baking sheet a wash. Remove the meat back the wire rack and baking sheet, cover and refrigerate. It can be sliced and eaten cold right now, but it’s best served warmed and hand carved on rye bread with spicy mustard. To heat it get a steaming right on the stove going and steam for about 45 minutes or until the internal temperature reaches 145 degrees. I made one small piece without the coriander and black pepper rub (above, lower left) but it just wasn’t right: more ham than pastrami. Don’t do it. When I’m preparing something like this I always make large batches: that’s thirteen pounds of meat on the tray: I doubled the recipe and it worked well.